This entry was posted in Uncategorized and tagged 515 yard drive, Austin Swing, Austinology, compound pivot, flammer, golf lesson, golf stance, long drive, MIke Austin secrets, Mike Austin swing, Mike Austin's compound pivot, swing speed by sluggo300. Bookmark the permalink. Your follow up and insights are always welcome! Simply incredible results. Hey Chuck, I had a good day today golfing. A new guy I have not played with before said he got a new 3wood, a rocketballz by taylormade. he said the facts and research says it flies the ball 17 yards farther, and so he will hit his three wood about 250 yards. He did just that! And he thought he killed it. Then I got on the tee box with my old 3wood, and the best drive of my life with that club, 310 yards straight down the middle. No lie, no joke. When we drove up to his ball, he was waiting for me to hit my ball. I told him I’m further down the fairway. After he hit his ball we kept driving forward and forward and could not find my ball. It was 70 yards in front of his. All I can say is I am going to devote all my practice time continually perfecting the MA swing per your guidance. I have solid results and am seeing low scores. People actually study and watch me hit the ball now. MA is the stuff! I will try not to clutter up your website posts with my exhuberance and enthusiasm but I have a killer swing that seems to get better as time goes by. Many thanks Chuck for all you have done. You got it CB! Thanks for the kind words and support. Hi Abe, You came to the right place for MA instruction. I have been studying Chuck’s videos over and over and over and over. It has helped me, listen to Chuck! Ive got power and accuracy, and its still getting better as I keep working at it. Hey Chuck, I’ve studied your videos so much now that while at the range today I could not help notice most other golfers have a lousy pivot and awkward ankle/knee/hip action. And of course below average results. Its interesting now how Im able to really focus in on how the MA mechanics work. Thank you again for your time and effort sharing your MA instruction and experiences here! Chuck, you have an excellent blog and I’m looking forward to the member site! I have a question regarding the feet being 12″ apart. Is the Austin way 12″ from inside the left heel to inside right heel or left toe to right toe (considering there is toe flair)? I am assuming it is 12″ from inside the left heel to inside the right heel, but assumptions are dangerous:) — Thanks again for posting VERY helpful clips and tips! I have to work on picking up my heels! Oh, and I forgot. I have said it before but that was the beauty of a Mike Austin lesson. He told me that he used purposesly use sounds (raised voice, grunting, even salty language) to reinforce the lesson point he was making. It resonates with you even years after the lesson. Glad to have you guys share in the experience. Awesome! So true. The pivot not only supplies power, it’s supplies rhythm – like dancing. I have to try to dig up a clip I have of Mike teaching the pivot to an on-looker at the next stall of the range. She was a former dancer in LA. A big smile appeared on her face when she realized that golf could be like dancing. And, of course, she picked up up with seconds. Now, when you take that idea and resultant rhythm to the course, the game becomes a lot more enjoyable. Hit balls today with “pick up the heel” ringing in my head. A great reminder and I was hitting them so well. The pivot (done right) sets up so much of the swing that the rest is easy but there are so many different “Mike Austin pivots” doing the rounds its great to hear/learn it from the man himself. You got it. I can literally here Mike screaming at some of the things that I hear preached. I owe it to him. I looked at the photo. Yes, his right hip is turning and it’s open at the time of the hit and opening/turning further after that. I have seen hundreds of hours of tape and hundreds of hours of Mike giving instruction. Still shots are often problematic. The camera angles can be odd. More importantly, you aren’t seeing the motion. Look at the last photo. His hips have turned around a lot. Others want you to believe that the hips didn’t move and all of a sudden they turned that far after the hit?! 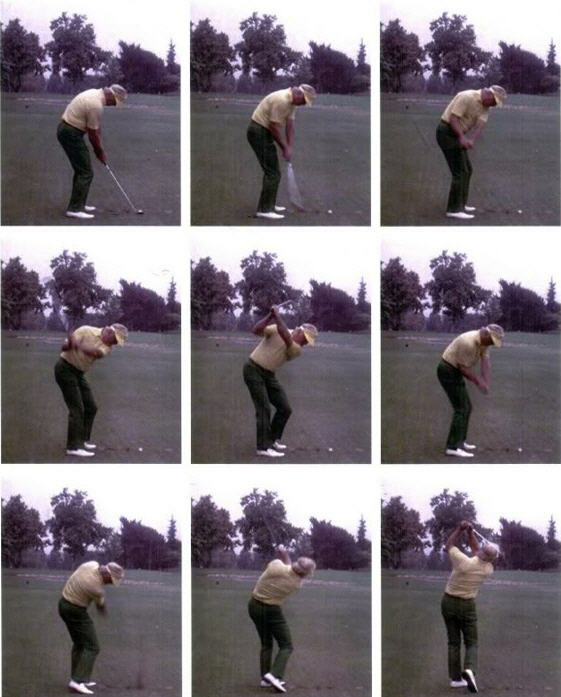 Review all of the prior video posts – the right hip and thigh “are the engine of the swing”. Thanks for the explanations and your passion for teaching correct! Please have a look at this link and picture number 7. Would you consider his right hip to be turned very much or?